While Keighley rock bunch As Sirens Fall are seemingly trying vociferously to stand out from a horde of bands of the same ilk, it’s hard not to look deeper and find yourself surrounded by a lack of substance and ingenuity. It’s not that the quintet won’t find themselves a fan-base with new EP Where Lost Things Go; in fact if you’re into the sound of Kids In Glass Houses meets Twin Atlantic you’ll find yourself comfortably at home here, but those looking for a more creative, expansive version of rock music in 2018 are going to be left starved after the EP’s six track run. ‘Lily’ is a perfect anchor for what the EP is looking to achieve: a song that doesn’t take itself too seriously with a monster hook in the chorus. Explosive rhythmic bursts through the verse make for a sense of predictable yet relaxing expectation, the simple structure works a treat, it’s a nailed on sing-along moment for the band, and you can never have too many of those. The issue for Where Lost Things Go is that beyond the first track there’s very little that even attempts to make a smudge on the blackboard – and in a time when squeaky clean rock music continues to struggle compared to the vibrant, organic sounds that are coming from the underground; As Sirens Fall sound like just another well produced, decent rock outfit. With that said things do take a sharp left when ‘In My Mind’ rears its head. 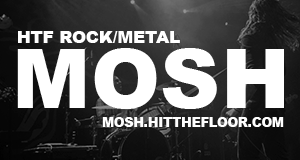 Featuring Benji Webbe of welsh reggae metal legends Skindred, it’s a mixture of styles from two completely different ends of the spectrum which on the odd occasion can work wonders, but the mesh between the two here sounds particularly bizarre. The EP’s squeaky clean presence quickly decides to throw some attitude into the mix, which unavoidably comes across as the token “Shall we put a bit of a heavy one in?”. For all of Where Lost Things Go‘s predictability, there’s no reason why it can’t set out to achieve its goals; it’s clear that As Sirens Fall have a set audience in mind – and it’s likely that some will gravitate to the EP. While falling short of the mark in terms of originality, ASF manage to do just enough here to keep eyes on them for the time being.